For many of us, our weight, health and/or self-esteem have felt like cages, and we have decided to break free. We encourage everyone to make a fitness/health goal to reach during our Challenge dates or choose your own Challenge dates based on the Middle Earth events. The Challenge brought us together while awaiting the release of The Return of the King in theaters, but anyone can take the Éowyn Challenge anytime. Use of this site: Taking the Éowyn Challenge or simply joining the walk is free . There are no forms to fill out, no questions to answer, no pop-up advertising, and no harassing e-mail. Simply join a discussion group or set out on your own. To enjoy all the benefits of the Éowyn Challenge Site, please read through the pages of this site carefully. On the Community Page, you will find links to various online discussion groups that participate in the Éowyn Challenge and The Walk to Rivendell. You will also find links to our Derndingle (chat), our photos, our calendar, our merchandise, and more. On the Walk Page, you will find details about the Walk to Rivendell Challenge. On the Tools Page , you can record your mileage in our database, find your location in Middle Earth, use journals to record your journey, send postcards to fellow walkers, and more. On the Links Page , we have included links to various LOTR sites, maps, fitness sites, and more. 458 MILES from Hobbiton to Rivendell! The original Walk to Rivendell Challenge began on Monday, March 17th, 2003, but it is never too late to join in. We have other distances throughout Middle Earth that you may choose to travel. The founder of this fitness challenge is our Ranger Jewel. She began researching the miles, milestones and time frame of the hobbits’ journey to Rivendell in Fellowship of the Ring . We were later joined by Karen Wynn Fonstad, author of the Atlas of Middle-earth. Mrs. Fonstad provided us with very detailed charts of all the Fellowship’s journey through Middle Earth. Much of the information provided is exclusive to the Eowyn Challenge and can be found nowhere else. The challenge is very simple and flexible; anyone can develop their own variation on this basic idea. For more information, see our Walk to Rivendell page. 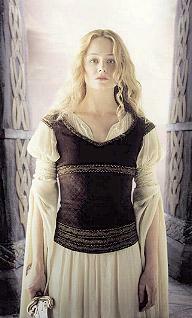 The Éowyn Challenge Web Site is operated by and is a fan site for fans of the Lord of the Rings Book Trilogy, by J.R.R. Tolkien, Ballantine Books, and the Lord of the Rings Movie Trilogy by New Line Cinemas and Director Peter Jackson. All quotes used on this site are either from the book series or the movie series, and we make no claim that these are own. Copyrights and trademarks for the books, films, articles, and other promotional materials are held by their respective owners and their use is allowed under the fair use clause of the Copyright Law. If any copyright or trademark owner herein objects to our use of their material on this site, they should contact the webmaster and such material will be taken down immediately. All copyrights to original artwork, photography, or literature posted on this site are the property of their owners. 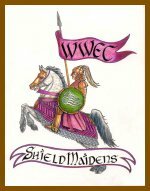 Shieldmaiden/Horse artwork by Éowyn Challenge Shieldmaiden Pansey Makehay.